Since its introduction in the beginning of this millennium, uniportal VATS has received great interests. Despite its advantages over conventional operations, uniportal VATS poses great challenges to the surgeon. This is mainly as a consequence of inserting and operating all the instruments via a small incision. In the uniportal VATS instruments have limited movement and instrument fencing is frequent with some haptic sensation loss. In addition, the vision is restricted as the endoscope is nearly parallel to the instruments. The advancement of technology has or will much alleviate these shortcomings. For example, wide-angled thoracoscope and flexible thoracoscope have to some extent lessen the fencing problem, and the wireless steerable endoscope system may further eliminate the instrument-endoscope fencing and provide panoramic view. New uniportal platforms derived from natural orifice transluminal endoscopic surgery (NOTES) and single-port access surgery approaches are on the horizon, which allows the uniportal VATS to be performed in a much easier way and via even smaller incisions. However, problems associated with provision of a steady platform, sufficient payload and applied force, tool change and equipment sterilization, haptic sensation, etc. remain to be solved. 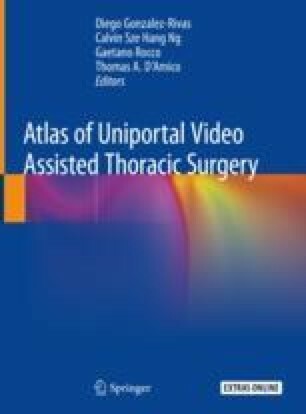 The diagnosis and intraoperative localization of small tumors can be challenging especially in uniportal VATS. Advanced multimodality image-guided operating room (AMIGO) and hybrid operating room can help in real-time diagnosis, localization and reduce the associated problems in patient transferring. EndoCAMeleon® Hopkins® Telescope (visited on 2016, July 20), Available https://www.karlstorz.com/hk/en/cardiovascular-surgery.htm. Endoeye by Olympus (visited on 2015, October 24), Available http://medical.olympusamerica.com/products/endoeye. The Flex Robotic System by Medrobotics (visited on 2015, October 24), Available http://medrobotics.com/gateway/flex-system-int/. Da Vinci Single Port Robot (visited on 2018, August 10), Available https://www.intuitivesurgical.com/sp/. The SPORTTM Surgical System by Titan Medical Inc. (visited on 2015, October 24), Available http://www.titanmedicalinc.com/. The SPIDER Surgical System by TransEnterix (visited on 2019, March 12), Available http://ir.transenterix.com/news-releases/news-release-details/transenterix-introduces-new-spider-surgical-system and https://www.sages.org/meetings/annual-meeting/abstracts-archive/single-port-cholecystectomy-with-the-transenterix-spider-a-single-institution-experience/.